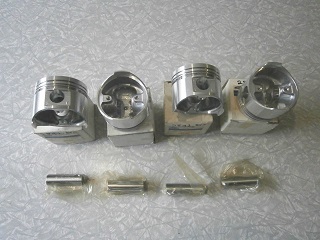 A SET of FOUR (4) New Mercury Capri Non-Turbo (Base Models), Premium Quality, Engine Pistons (STANDARD or OVER-SIZED SIZES). Again, these Mercury Capri Pistons are sold in a set of four (4), and thus NOT sold individually. Simply use the drop down menu to select Standard Sized (SPECIFICATIONS): DIAMETER CYLINDER: 78.00mm. INCH DIAMETER: 3.071. DIAMETER BOLT: 20.00mm. BOLT LENGHT: 61.00mm. COMPRESSION DISTANCE: 32.20mm. SLOTS: 1.5 X 1.5 X 4.0. RINGS: 4737 / 2C4737 / 2M4737. GLOSSY FINISH. These Mercury Capri Pistons / Capri Pistons (Base Model) are also available Over-sized by .010, or Over sized .020. Kindly use the dropdown menu below to select the desired size. These, Premium Quality, Mercury Capri Pistons are only sold as a set of four (4), and are available for both Manual Transmission ( MT, M/T) and Automatic Transmission ( AT, A/T) equipped vehicles. To select the correct Pistons based on your Model Capri (Manual Transmission - M/T, MT, OR Automatic Transmission - A/T, AT), simply use the drop-down menu provided. These Mercury Capri Pistons Engine (B6 Series DOHC) are extremely rare part, and are no longer available through Ford dealers & are thus considered "obsolete". Therefore shipping will be delayed for approximately two (2) business weeks, and as per our stated store policies, "All Sales Are Final" and "As Is"....no returns, refunds, exchanges, or store credits. Application: All 1991, 1992, 1993, 1994 Mercury Capri non-turbo models requiring a Mercury Capri Standard or Over-Sized replacement pistons: 1991 / 91 Mercury Capri Pistons - Non Turbo, 1992 / 92 Mercury Capri Pistons with Pins - Non Turbo, 1993 / 93 Mercury Capri Pistons - Non Turbo, 1994 / 94 Mercury Capri Pistons - Non Turbo. *Please Note: This Mercury Capri Non-turbo Piston set is no longer available through Ford dealerships and any known sources and is considered obsolete. We are fortunate to have a few remaining Mercury Capri Non-turbo Piston Sets remaining in inventory. However, please remember that as per our stated policies relative to Obsolete parts such as this Non-turbo Piston Sets. All Sales Are Final "As Is"...No Returns, Exchanges, Refunds, and/or store credits.